I loved reading all of your answers for the fun quiz we had last week! And to keep the good times going and because I can’t wait for summer to get here…….. 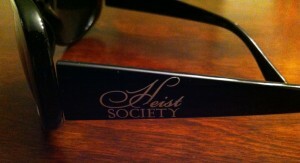 I am giving away some Heist Society promotional sunglasses this week!!!! Here is what you need to do: Just comment what you are looking forward to most this summer! I will pick a random winner on Wednesday at 8:00 a.m. central time! U.S. Residence only please! P.S. These are promotional sunglasses therefore we cannot guarantee the UVA or UVB protection! Wear at your own risk! P.S.S. I love cleaning out Ally’s closets and finding cool stuff to give away! Hope everyone had a fantastic weekend and happy Magnificent Monday! I am going to try something new this week……… a Picture Sudoku challenge made from Heist Series book covers! Just use this link Heist Sudoku to try it out! There are instructions on the webpage and help if you need it. Let me know how it goes. Also, please send me your artwork for Fan Art Fridays to [email protected] and I will put them on Ally’s Tumblr page on Fridays. P.S. Little known fact, Ally makes really great guacamole!!!! Magnificent Monday: Ally is still on tour!!! Hope everyone is having a Magnificent Monday and enjoying Perfect Scoundrels! For Fan Art Friday this week & in honor of Valentines day let’s see some valentines for Hale or your favorite Ally character! Send your valentines to [email protected] and I will put some on Ally’s Tumblr page. Also, don’t forget to check the News & Events page to see if Ally is in your area on tour NOW! P.S. You can sign up for text alerts for when Ally is in your area? Message & Data rates may apply. P.S.S. Did anyone receive a text alert for this tour? Let me know if it worked! P.S.S. I miss Ally when she is on tour! Hope you guys are enjoying her when she is in your area! Magnificent Monday 1 Day Left!!! Only 1 day left before PERFECT SCOUNDRELS is available!!!! To get everyone excited I have an excerpt to share! Kat had to wonder for a minute what that would feel like–homework and uniforms, walks home with nice boys offering to carry your bag. That was her life once. Almost. But Hale had gotten her kicked out of Colgan School, pulled her back into her own world, just like now he’d been pulled back into his. “So why are you here, Kat?” Nick asked. You can sign up for text alerts for when Ally is in your area? Message & Data rates may apply. P.S. don’t forget to send all your fan art to [email protected] so I can post on Ally’s Tumblr page for Fan Art Fridays! Winner of Magnificent Monday Giveaway!! Thank you so much for all the comments! I have really had a great time reading them! The winner of the Perfect Scoundrels signed copy by Ally herself is…. The thing that I like most about the Heist series is probably that it’s different than the Gallagher Girls series. It’s the opposite of what Cammie does. Cammie tries to bring down an ancient group , while Kat steals different things, bringing them back to their rightful place/owner. The Heist series has different twists and turns, that’s what I like most about them, you don’t know what’s going to happen next. First comment! Yay! Congrats Frenchie! Please email me at [email protected] and let me know the address to ship your book too. You may wonder how I picked Frenchie as the winner. Well I assigned everyone a number and did a random number generator to randomly pick the winning number. The number generator picked number 6 and that happened to be Frenchie’s number in the comment section! Thanks to everyone who participated! See you next Monday! Thank you all so much for the warm welcome! I have read all your comments and taken notes. My first super fun activity in honor of Perfect Scoundrels coming out next week is……….. I am giving away a before you can buy it, super awesome, signed copy of Perfect Scoundrels!!!! Just comment on this post and let me know what you like best about the Heist series. I need all comments by Tuesday, January 29, at 8am eastern time. Sorry only US residents only. Please only comment one time. One winner will be chosen randomly from the comments made. Don’t forget if you can’t wait until next week for some new Ally Carter Double Crossed is out now! I am so excited for all the fun things I have planned next month! Check back each Monday and hopefully I can help make it magnificent! And don’t forget to send all your fan art to [email protected] so I can post on Ally’s Tumblr page for Fan Art Fridays. P.S. Ally goes on tour next month!!!! Did you know that you can sign up for text alerts for when Ally is in your area? Message & Data rates may apply. P.S.S. Funniest thing Ally said to me this week, ” You’re as handy as a pocket on a shirt!” She cracks me up! So happy to finally be able to share the COMPLETE list of tour events that will mark the release of Heist Society 3, PERFECT SCOUNDRELS! I do hope you will be able to join me at one of the following events. If not, please contact any of the host stores about ordering a personalized book and having it shipped to you.And, as always, please check with the host stores about their individual policies regarding photos, books from home, the number of books each person can have signed, etc. Right this minute Hurricane Sandy is on its approach to the East Coast. I know a lot of you guys live in the area, so please stay safe and know the rest of us are thinking about you! And…to help ride out the storm I offer you the following PERFECT SCOUNDRELS MINI EXCERPT! The woods seemed different on the long walk back to the car, and Kat couldn’t shake the feeling that she was forgetting something. Then she stopped and looked at the house. Katarina Bishop and W.W. Hale the fifth were born to lead completely different lives: Kat comes from a long, proud line of loveable criminal masterminds, while Hale is the scion of one of the most seemingly perfect dynasties in the world. If their families have one thing in common, it’s that they both know how to stay under the radar while getting—or stealing—whatever they want. So what do you say, guys? Are you excited? Because, dude, I am EXCITED.